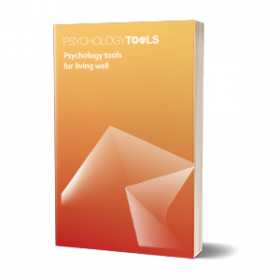 Self-monitoring of thoughts, feelings, and symptoms is an essential skill in cognitive behavioural therapy (CBT). 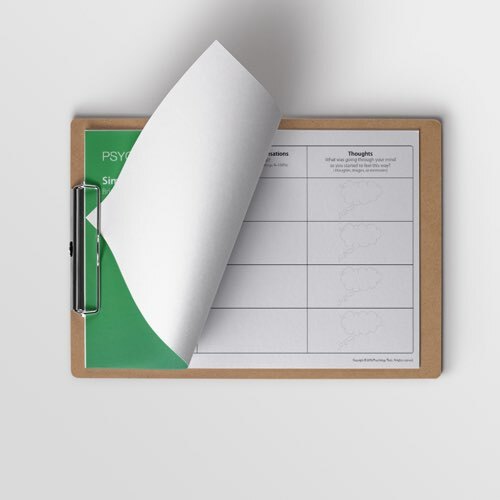 This Simple Thought Monitoring Record is an excellent introduction to the process of collecting (negative) automatic thoughts, emotions, and the situations in which they are experienced. 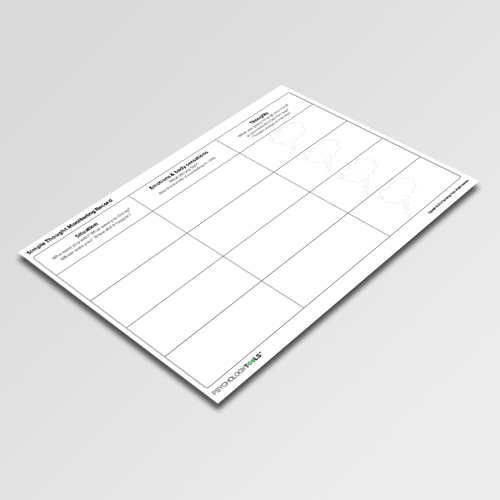 Introducing complex thought monitoring & challenging forms (e.g. the traditional 7-column thought record) too early in therapy can be confusing for patients. Difficult early experiences of thought monitoring can be an obstacle to client’s engagement in therapy and sometimes a graduated approach is helpful. 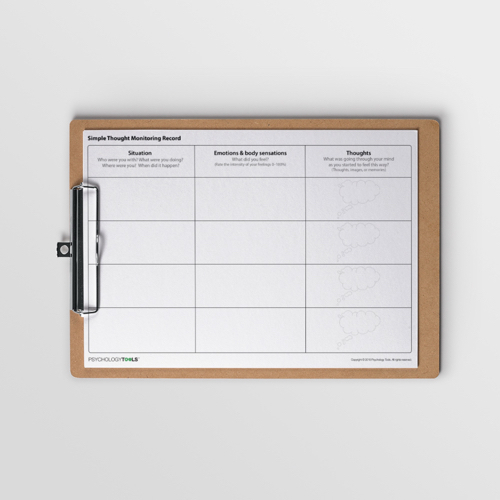 The Simple Thought Monitoring Record is a straightforward worksheet to introduce the concept of identification of automatic thoughts and linking these to emotional states. Spending up to a couple of sessions simple practising the identification of automatic thoughts and images before attempting restructuring is often time very well spent. 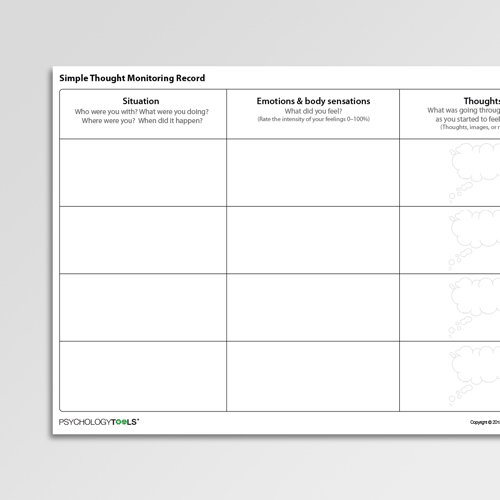 The Simple Thought Monitoring Record is a straightforward worksheet to introduce the concept of identification of automatic thoughts and linking these to emotional states. Spending up to a couple of sessions simple practising the identification of automatic thoughts and images before attempting restructuring is often time very well spent. Clients should be instructed to record specific instances in which angry thoughts, feelings, or responses were prompted. In the second column (Emotions & body sensations) clients should be instructed to record their emotional reactions in that moment (which can typically be described using single words, e.g. anxious, sad, humiliated). Clients should be encouraged to rate the intensity of these sensations on 0–100% scale. Clients should be instructed to record associated body sensations (e.g. tightness in my stomach). In the third column (Thoughts) clients should be directed to record any automatic cognitions. They should be reminded that cognitions can take the form of verbal thoughts, but can also take the form of images, or memories. If a recorded cognition is an image (e.g. “I had a picture in my mind of dying in hospital with my family looking concerned”) clients should be directed to question what that image means to them (e.g “It means I worry about how my family could cope without me”) and to record that idiosyncratic meaning.